Nighttime Anxiety: 5 Ways To Stop It Ruining Your Life! Many of us with a panic disorder tend to drag that worry into our bedtime. The reason for this could be many things, from family pressures to work related stress. It is estimated that between 50-65% of us who suffer from a panic disorder will have a panic attack of some sort during bedtime at least once. And of course, when there is a first time, there is always the fear that it will happen again, which then perpetuates the panic even further. The problem is that if you don’t have a good back up plan in dealing with your nightly terrors, the chances are that it is only going to happen again, and you will be wasting even more time by tossing and turning in bed, where usually the best thing to do would be to activate your mind. Despite what might be a daunting task, overcoming panic attacks at night need not be an enduring ritual. 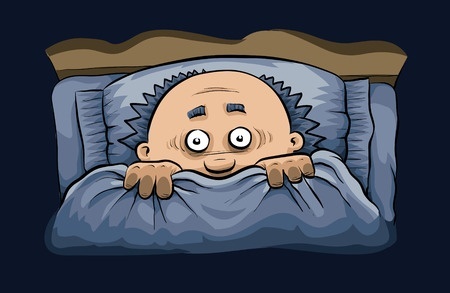 There are key steps that you can use in order to minimize your bed time terror, and still have a rejuvenating sleep! Medication, in many peoples cases only relieves you of the symptoms on a short term basis. You still need to find psychological and spiritual coping strategies if you want to recover in the long run. Caffeine is a proven stimulant, so taken this before bedtime simply means you are going to stay awake and find sleeping very difficult, and can even create insomnia (it is said that caffeine has a half-life of 6 hours). Alcohol, while very tempting, is also indirectly a stimulant. Sounds silly and ridiculous, by incredibly this can sometimes work. By looking at the clock, you can inadvertently trigger more anxiety because you feel that you should be sleeping, not staying awake. You have to actually move and turn the clock away so you can’t see the lights (which can also keep you awake as well). Exercise is not only very healthy for you, but if done a few several hours before bed-time, before the panic of night starts to creep in, can actually help you drift off to sleep even quicker. The best form of exercise is a form of H.I.I.T (High-Intensity Interval Training). Basically, you do something short but quick, i.e. use a stationary bike or run outside for a good 60 seconds at top speed. The trick here is to raise your heart beat so you are panting, recover to bring it back down, then rinse and repeat. This type of exercise is famous for improving your lung capacity, and will help promote more Testosterone and Human Growth Hormone when you sleep. It also helps you to fall asleep more quickly as well. This not only helps you relax as it helps activate the parasympathetic nervous system, but Valerian root tea can also be used to help promote a good night sleep, by reducing the anxiety you are feeling. If you do find yourself going to bed, and you are still tossing and turning for 15 minutes, don’t waste any more time. Read a book, or get up and do something. Actually try to engage your mind in something that is not too stimulating, but still quite fun. Only return to bed (or turn of the lights) when you find that you are getting increasingly tired. But what happens when you wake up from a night terror? If you have tried the above, found yourself going to bed on time, and drifted of quite easily thanks to some Valerian root tea and exercise, you may find that you have a panic attack when you dream. I remember once having a dream when sheer terror filled my heart, I almost woke up in a sweat! The trick here is to get up and do something active once you wake. Give yourself a few minutes to see if you can fall asleep again (although not likely) and then get up for real. Try to really wake yourself, by splashing water on your face, start reading, or even checking downstairs (but don’t turn on the TV!). Try to work with the panic and let the feeling work over you. Just remember, it’s just a feeling. If you wish, try belly breathing to help calm you down, and even practice mindfulness meditation (being hear and now) so you can pay attention to any thoughts that can be making the panic worse. Only once you’ve done this, should you start to feel sleepy. If you find that your eyelids are dropping, or you are yawning a lot, go back to bed. If you find that having done all this you are still very alert, try doing a boring task like tidying your bedroom. Try the above out, and let me know how you get on. By finding coping strategies for dealing with night terrors, this will also ensure you have a good night sleep which will help you with your panic attacks during the day. And prolonged good sleep will always help promote long term recovery. Previous PostPrevious 6 Ways to get your confidence back if you suffer from anxiety! Next PostNext Suffer from social anxiety? A quick guide to help you!